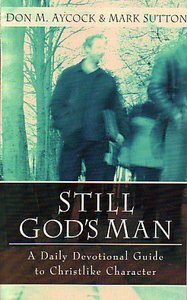 "The authors of Still God's Man are both Baptist ministers who, as husbands, fathers, and pastors, are experienced in life's trials and tribulations. They teamed up to hammer out a common-sense daily devotional that is man-friendly, clear and on point for God's men. No jock talk, no he-man stuff; just straight talk about everyday challenges that test men's faithoand ought to more firmly fix it. Concise, one-page devotionals are accompanied by simple prayers that are masterpieces in miniature." - Publisher "^This sequel to the best-seller "God's Man" takes men on a 365-day journey through the Bible. How can men be all male and godly at the same time? Writers Don Aycock and Mark Sutton move chronologically through the Bible demonstrating how God's grace can be applied in their lives using examples from Scripture and life for every challenging point. Encouraging and relevant, this daily devotional shows men what advice and promises are in store as they move through the Scriptures.Short, easy-to-read devotionalsA thoughtful prayer at the end of each devotionalChronological look at the Bible"
- Publisher Designed to help men navigate through an entire year, this book is a powerful chronological study of the Bible and the encounters everyday pilgrims have had with God. About "Still God's Man: A Daily Devotional Guide to Christlike Character"
"^This sequel to the best-seller "God's Man" takes men on a 365-day journey through the Bible. How can men be all male and godly at the same time? Writers Don Aycock and Mark Sutton move chronologically through the Bible demonstrating how God's grace can be applied in their lives using examples from Scripture and life for every challenging point. Encouraging and relevant, this daily devotional shows men what advice and promises are in store as they move through the Scriptures.Short, easy-to-read devotionalsA thoughtful prayer at the end of each devotionalChronological look at the Bible"
Designed to help men navigate through an entire year, this book is a powerful chronological study of the Bible and the encounters everyday pilgrims have had with God.